Martin Thöni was born in 1947 in Langtaufers/Graun (Vinschgau Region, South Tyrol); he is by profession a geologist / geochronologist (a retired professor of the University of Vienna, Austria). Ever since his first contact with India and Tibet, in the course of field work in Kulu-Lahaul (Himachal Pradesh, India) for his doctoral thesis in 1972-1973, he has deeply studied the cultures and the complex spiritual and religion-based world views of the inhabitants of the Indo-Tibetan region. Beginning in 1977, he has undertaken ten further field campaigns and journeys to a variety of Tibetan areas (including three to Mt. 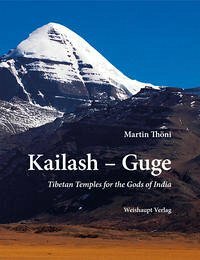 Kailash) and of the Himalayas (India, Nepal, Bhutan); these sojourns progressively increased his awareness of the diversity of the natural and cultural realms surrounding the highest mountain range and plateau of Earth. In the course of the past ten years the author also paid repeated visits to significant cultural centres and temple cities in North, Central and South India.